You really have to like working in the soil to be an effective gardener. I find the best time of day is early morning, despite the fact that the Mosquitos will eat you alive. I am trying to plant things that will do well in our small farm store - zucchini, cucumber, carrots. I am even trying potatoes this year. The trouble is that I am quite enjoying myself, and next year when my mat leave is over I am going to miss having this time to garden. I just hope I can keep it up. 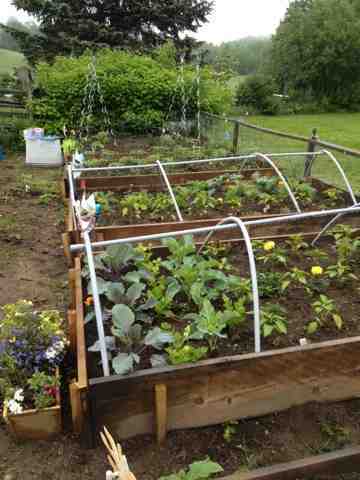 The raised beds make the world of difference. Things are growing in leaps and bounds and covering them with greenhouse plastic gave me a good head start. This is our raspberry and strawberry patch. If the birds don't eat them we will have a good yield this year. 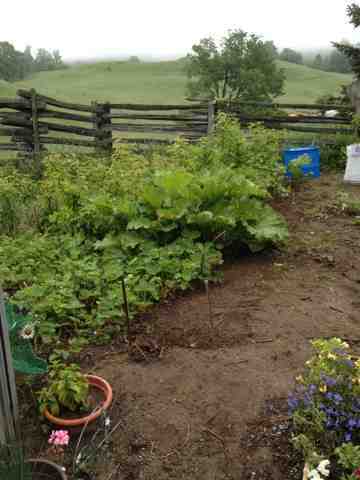 And yes, that is one gigantic happy rhubarb! I can't wait to make rhubarb pies!